No. 1 Stony Brook Women’s Lacrosse continued to roll on Tuesday night, scoring 20 goals in a 20-8 victory over Delaware at Delaware Stadium. The Seawolves finish their road trip with a perfect 3-0 record, and are now 6-0 on the season. Senior attacker Kylie Ohlmiller had a season-high 10 points, scoring six goals and assisting on another four. Redshirt-senior attacker Courtney Murphy scored five goals and recorded two assists, giving her seven points on the night. The Blue Hens were in control for a majority of the first half, something the Seawolves were not accustomed to. Stony Brook fell behind Delaware 6-4 with just over five minutes left in the half. That would have been the first time all season the team headed to the locker room trailing its opponent. The Seawolves then went on one of their runs, and the rest is history. Ohlmiller and Murphy scored a combined six goals during the Seawolves’ 9-0 run that spanned from 4:25 left in the first half to 22:59 left in the second half, pushing the score to 13-6 in favor of the Seawolves. The Blue Hens responded with a quick two goals, but the Seawolves sealed the deal with a 7-0 run. Stony Brook had 19 of the total 29 draw controls Tuesday night, one less than the total amount of goals the team scored. The team also took a season-high 40 shots, with 34 of them being on goal. The Seawolves have not taken less than 30 shots in any game this season and have recorded 195 shots in six games. Junior midfielder Keri McCarthy, sophomore attacker Taryn Ohlmiller and sophomore midfielder Ally Kennedy added two goals apiece. Freshman attacker Rebecca Kinsley scored her first career goal for the Seawolves, finding the back of the net with 20 seconds remaining in the contest. 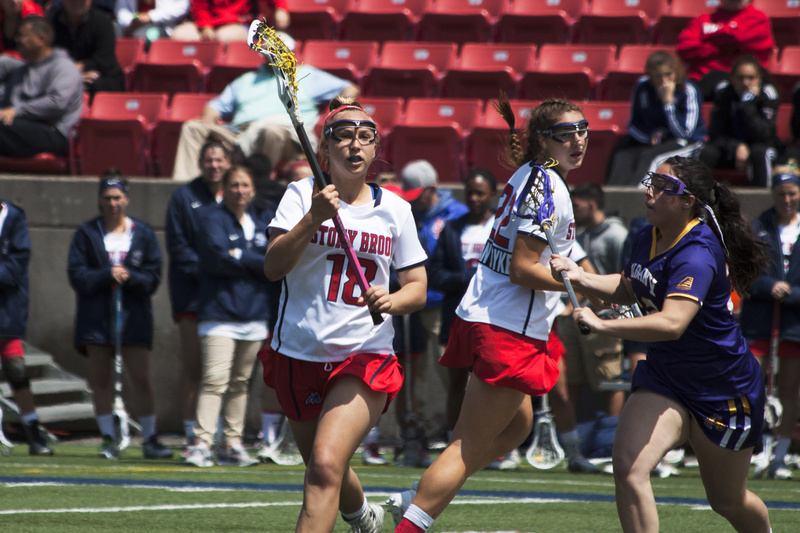 Stony Brook will return home to Kenneth P. LaValle Stadium on Saturday, March 17 for a game against No. 10-ranked Towson. The matchup is slated for a 5 p.m. start.